Ticketing has begun just today and several theaters are already selling out! Do not miss the opportunity to see this groundbreaking show directly from its Broadway production in this stunning cinematic version. More than 600 theaters nationwide have subscribed to show Allegiance on December 13th. Get your tickets now! Tickets are now on sale for “George Takei’s Allegiance: The Broadway Musical On The Big Screen” in movie theaters nationwide for one night on Tuesday, December 13 at 7:30 p.m. local time. The event will begin with an exclusive introduction from Takei, and following the production, audiences will see special behind-the-scenes footage and interviews with the cast and creators. Allegiance illuminates one of American history’s lesser known chapters as it tells the story of Sam Kimura (Takei), transported back nearly six decades to when his younger self (Telly Leung, Godspell, “Glee”) and his sister Kei (Tony Award®-winner Lea Salonga, Miss Saigon, Mulan) fought to stay connected to their heritage, their family and themselves after Japanese Americans were wrongfully imprisoned during World War II. An important story told with great resonance and intimacy, Allegiance explores the ties that bind us, the struggle to persevere and the overwhelming power of forgiveness and, most especially, love. 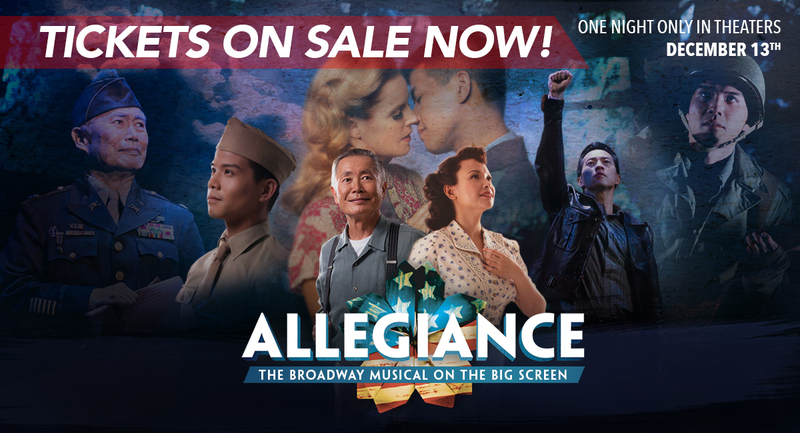 Tickets for “George Takei’s Allegiance: The Broadway Musical On The Big Screen” can be purchased online via allegiancemusical.com/movie or at participating theater box offices (theaters and participants are subject to change).